It seems likely that Cypripedium candidum (small white lady's-slipper) was actually a common species on the prairies of southern and western Minnesota before the advent of large-scale agriculture in the late 19th century. Since that time it has declined in proportion to the decline in its prairie habitat, a loss estimated at greater than 98% (Minnesota's Remaining Native Prairie). This loss is quite apparent and dramatic when driving through the prairie region of the state and seeing mile upon mile of corn fields, where once there was prairie. Botanical surveys of remnant prairie habitats in Minnesota since 1980 have located and documented nearly 200 occurrences of C. candidum, which makes Minnesota the stronghold of this species. In fact, Minnesota probably has more plants than all other states and Canadian provinces combined. And yet, the species in Minnesota has experienced a 95%+ population decline; a trend that continues today. Since 1980, C. candidum has disappeared from many of the smaller sites where it had previously been documented. These smaller habitats are often "postage stamp" fragments less than 4 ha (10 ac.) in size, and they make up the greatest number of occupied sites, if not number of individuals. Needless to say, their loss is extremely troubling. Because of its dramatic habitat loss and the continental significance of Minnesota populations, C. candidum was listed as a state special concern species in 1984. The stems of C. candidum are 10-35 cm (3.9-13.8 in.) tall, with up to 50 or more arising from a single branching rhizome. The leaves number 2-4, and are mostly in the upper half of the stem. They are narrowly ovate to lance-elliptical or elliptical, 5-15 cm (2.0-5.9 in.) long, and 2-6 cm (0.8-2.4 in.) wide. The inflorescence is a single flower subtended by a leaflike bract 3.3-11 cm (1.3-4.3 in.) long. The dorsal sepal is ovate to elliptical, greenish yellow, and 1.7-2.5 cm (0.7-1.0 in.) long. The lateral sepals are fused to form a single synsepal located directly below the pouch. The apex of the synsepal is split, otherwise it is similar to the dorsal sepal. The petals are lance-linear, similar in color to the sepals, and 2.1-4.1 cm (0.8-1.6 in.) long. The floral lip is an inflated pouch, white in color, occasionally with faint purple veins or spots, obovoid in shape, and 1.7-2.5 cm (0.7-1.0 in.) long (Smith 1993). The habitat of C. candidum is primarily deep-soil mesic prairies. Wet prairies, certain types of sedge meadows, and calcareous fens (in the south) can also support this species. It does not occur in habitats with a history of livestock grazing or crop production. The soils are primarily calcareous till or lacustrine clays, or occasionally fibric, sedge-derived peat. Like most members of the genus Cypripedium (the lady's-slippers), C. candidum is a slow growing, long-lived plant that requires an estimated 12 years or more to reach maturity (Curtis 1943). The maximum age can only be guessed but probably exceeds 50 years. The flowers are reported to be pollinated by small andrenid and halictine bees (Catling and Knerer 1980). The seeds are very small, not much larger than dust, and can be carried on the wind for considerable distances. Germination of the seeds requires ideal moisture conditions and the presence a specific mycorrhizal soil fungus. As in all terrestrial orchids, the seeds of C. candidum contain no nutrients and receive organic compounds from fungal hyphae that have penetrated the seed coat. It is unknown if this fungal relationship continues after C. candidum has developed roots and photosynthetic leaves. Peak anthesis for C. candidum in Minnesota is usually around June 1, but flowers start developing in mid to late May. Frosts occasionally occur at that time of the year, and flowers of C. candidum are known to be damaged by frost. But because C. candidum is a long-lived perennial, the loss of seed production capability for one year probably does not have a negative long-term affect on a population. Herbivory by native prairie animals has also been observed, but is not known to be a management problem. Domestic livestock grazing on the other hand can be extremely harmful to C. candidum and should be avoided. Soil disturbance, incidental herbicide exposure, hydrologic alterations, competition from non-native, sod-forming grasses, and shading by encroaching shrubs are also management concerns, especially on small habitat fragments surrounded by agricultural fields. Spring burns may be useful and beneficial in habitat management, but should be conducted early in the spring, before C. candidum appears above ground. The best time to search for C. candidum is when it is in flower from May 19-June 22. Several prairie preserves that are owned and managed by public and private conservation organizations have healthy populations of C. candidum. In most cases, established prairie management techniques employed at those sites seem to benefit C. candidum. Catling, P. M., and G. Knerer. 1980. 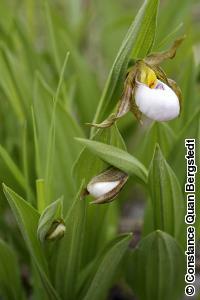 Pollination of the small white lady's-slipper (Cypripedium candidum) in Lambton County, southern Ontario. Canadian Field-Naturalist 94:435-38. Curtis, J. T. 1943. Germination and seedling development in five species of Cypripedium. American Journal of Botany 30:199-206. Sheviak, C. J. 2002. Cypripedium. Pages 499-507 in Flora of North America Editorial Committee, editors. Flora of North America north of Mexico. Volume 26. Oxford University Press, New York, New York.